Just sold to Germany 24/8/12!! Just sold to New York 22/8/12!! Just sold to Beverly Hills 17/5/12 !! Just sold to New York U.S.A 4/1/12!! Just sold to Greece 12/11/11!! "Yvette Guilbert singing "Linger, Longer, Loo" (1894)Toulouse-Lautrec rendition by David Aldus! Just sold to California U.S.A 25/10/11!! Just Sold to Singapore 22/8/11!! Just Sold at Auction 13/8/11!! David Aldus exhibits at the Turner Contemporary!! David Aldus paintings on BBC news!!! Just Sold to U.S.A 3/5/11!! Feel free to contact us by phone or email / message. All offers on any paintings considered by our friendly staff!! 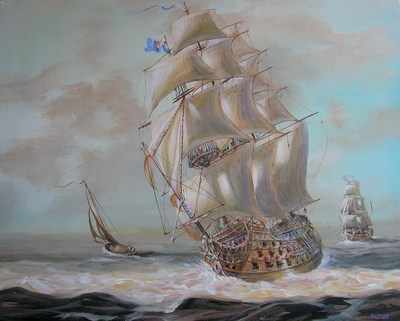 MAGNIFICENT ORIGINAL HIGH PRESTIGE EXHIBITION STANDARD OIL PAINTING "H.M.S Conqueror" . BY THE FABULOUS ARTIST DAVID ALDUS. This exquisite painting capturing the triumphant return to the Solent of Captain Pellew's H.M.S Conqueror after it's success at the Battle of Trafalgar ................. Highest price received for one of his paintings is £20,000. Absolute investment opportunity! ) Measurements height 16 inches by 20 inches. Oil on Canvas..............Box framed. Just sold to Greece 8/1/12!! Just sold to California U.S.A 4/1/12!! Just sold to Tasmania, Australia 16/11/11!! Just Sold to California U.S.A 23/10/11!! Just Sold to Singapore 6/9/11!! Just Sold to Singapore 27/8/11!! Turner Contemporary / O.T.S Gallery. Click on image to enter Gallery to view Aldus paintings exhibited! Just Sold to U.S.A 17/5/11!! Just Sold to New York 18/12/10!! "Tête de Clown" 1955 Bernard Buffet Reproduction by David Aldus.